Even Cookie was stunned by all the craziness of the season finale of Empire. It’s the dramatic two-hour finale of Empire, with appearances by Patti LaBelle, Rita Ora, Snoop Dogg and Juicy J. Actually, it’s a one-hour finale filled with an extra 60 minutes of flashbacks and filler. Take a drink whenever you see Lucious’ do-rag, Bunkie’s shooting or the infamous trash-can scene. Let’s go. One week away from the tribute concert and IPO, Lucious is ailing. He has double vision, a symptom not typically associated with ALS; the nurse shares this with Becky instead of just telling Lucious. What kind of chatty nurse is this? Malcolm and Cookie visit a snow-covered cabin in the Berkshires. He finally gets to “take these cookies.” When Lucious learns of the tryst, he tells Cookie she never really sat on the board because she’s a convicted felon. Malcolm wisely takes a job in D.C. Still furious that Lucious bribed Camilla to go away, Hakeem spills the tea with a rap about how horrible Lucious is. Don’t piss off your son right before open-mic night. Lucious punches out Hakeem, who stomps off to an Illuminati meeting. Andre also decides he’s done after a talk with Michelle, the music therapist from the mental-health facility. Running out of sons, Lucious cozies up to Jamal. Despite the fact that Jamal just found out that his ex-wife, Olivia, was impregnated by Lucious, he’s open to reconciling. He’s probably relieved that Lucious rescued him from a simpleton. They head to Aunt Carol’s Philly home for a walk down memory lane. The infamous metal trash cans in which Lucious tossed young Jamal are still there—Carol hasn’t upgraded to Rubbermaid yet? They sing together; the musical sequence includes a flashback to Bunkie’s shooting and Lucious singing the lyric Dormez-vous. Lucious knows French? Does he sing “Frère Jacques”? Jamal acts as Lucious’ enforcer, and all of a sudden the mild-mannered son is Suge Knight. He confronts rival Billy Baretti. To get Baretti to surrender master copies of Lucious’ songs, Jamal dangles him over an unconvincing green-screen ledge. While all that’s going on, Lucious finds Hakeem in the sack with Boo Boo Kitty. He only seems mildly perturbed. His next order of business is to sabotage Andre’s recent interest in God, so he offers Michelle a record deal. She writes Jesus a “Dear John” letter and Andre is irrationally disappointed in a woman he barely knows. It’s official, Lucious doesn’t have ALS. He suffers from myasthenia gravis. The bait-and-switch makes me sad. I have a friend suffering from ALS, and he loves Empire because it showcased the disease. Lucious gets a new medication, and as one of the side effects, he hallucinates about Bunkie just sitting on the bed gleefully rattling his gold chain like the Ghost of Christmas Past. Cookie, who is back in at Empire and is inexplicably roaming the mansion, enters Lucious’ bedroom in time to hear his sleep-talking confession to Bunkie’s murder and the revelation that he isn’t dying. Lucious fails to mention that this is an extremely lazy scene. The next day, Lucious gathers his sons to hand out gaudy gold symbolic presents. Jamal’s is a lion’s head: He’s the one who will run Empire. Cookie, Andre and Hakeem (who has improbably learned about hostile takeovers from Boo Boo Kitty) unite to control Empire. Boo Boo Kitty is there, and the catfight that has been brewing all season erupts. Although Cookie spent 17 years in the pen, Boo Boo holds her own. Peace talks ensue, and Kitty proposes that they consult Tricky Trichter, an expert in corporate takeovers. The feds continue to press Cookie for info on Lucious. They have a witness who told them that Lucious killed her cousin Bunkie. 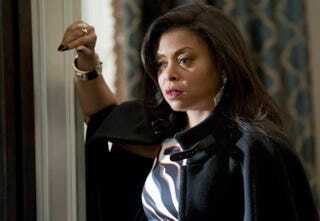 Cookie remembers Lucious mumbling in his sleep about the witness, but she keeps mum. She later questions Vernon, who admits that Lucious killed Bunkie. Vernon visits Andre to talk business, and they get into a violent confrontation. Rhonda looks for weapons; after ruling out the lead pipe and revolver, she grabs a candlestick and accidentally kills Vernon with it. Andre wants to call the cops, but she refuses because everyone knows how cruel the justice system is to young, white, blond ladies. Just to cram in some more plot, Rhonda announces that she’s pregnant. The IPO goes through. Lucious wonders where Vernon is. It’s the night of the star-studded concert. Everyone is there, including Michelle, who somehow has arranged an elaborate routine in mere days. In a rushed ending, Lucious confides to Jamal that his real name is Dwight Walker and that he was an orphan and whatever else will pad these two hours. Before Lucious can take the stage, the cops arrest him for murdering Bunkie—and abusing an extra hour. He blames Cookie. Behind bars, Lucious breaks the fourth wall to warn us all to watch our backs.